I recently received some new rubber from Hearts in Touch. 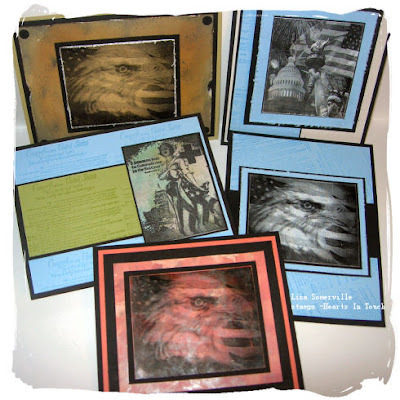 I've been working with a few images from the Liberty Sheet, and decided to give them away to my blog readers. All you need to do is leave a comment on this post along with your email address, by Saturday, September 22. I'll have the random number generator pick a winner on Sunday, September 23, and will be mailing the winner the cards shown below. On these cards, I've used some techniques from past issues of The Technique Junkies Newsletter (Fossil Stone and Burnt Edges). I also used the Metallic Alcohol Roll Technique from the upcoming October Issue, and the bottom card uses the Polished Stone tutorial that you can find here on my blog. Be sure to click here to read about the special pricing offer for the Technique Junkies Newsletter. ETA - Blog Candy Winner posted...Thanks for playing! O Lisa, I love these stamps! I did check out their site and look around...very cute! My dad (now 80) was in the US Navy and these would be SO awesome! Hi Darling Lisa : Your cards are sooo beautiful .. If I won your blog candy you probably already know where I would send these HUH? Lisa - great images and great cards - my husband would latch on to these so fast my head would spin. Lisa, I love your cards! Soooo gorgeous! They would be perfect for my Army son. Thanks for sharing! My comment was just submitted, then this page came up. Don't know why it put "d" as my name, as I entered "Donna". Oh how I'd love to have one of these cards that you've created. They are all awesome! I especially like the bottom one, with the reddish/pickish hue. Oh to be as talented as you...that is my new mantra. Thanks so much for sharing. You've done something with this rubber than I would have imagined. Wonderful work! These are just lovely. TFS! These are really awesome. Thanks for sharing. These cards are absolutely beautiful! My employer has a program where we send packages to our military personnel overseas- if I win that is where these are going! Just beautiful they are - beautiful! Thanks for sharing! Lisa - I'm a HIT member and was so happy to see your cards. I don't have that sheet but need it now that I see what can be done with it! Would love to have a sample!! thanks for the chance! OH MY what beautiful cards! Lovely cards Lisa. So unusual. Would be proud to own those.